Cal here for Tuesday S-T-R-E-T-C-H. It looks like some folks have been stretching to buy some rare carnival glass lately. I’m thinking I probably wouldn’t be serving iced tea in those pitchers which just sold the other week. I’d probably have them locked up in a cabinet. We also have some stretch glass that is considered quite rare and I thought I would share a few pieces with you tonight. Most of this stretch glass has not been on the market recently, so we don’t have any recent sale prices to share with you, but I hope you will enjoy seeing some stretch glass that you (and we) don’t see every day. First up is the only known red Diamond bon bon. This was in the Fenton Glass Museum for many years but it made its way into the private sector when the museum was closing. 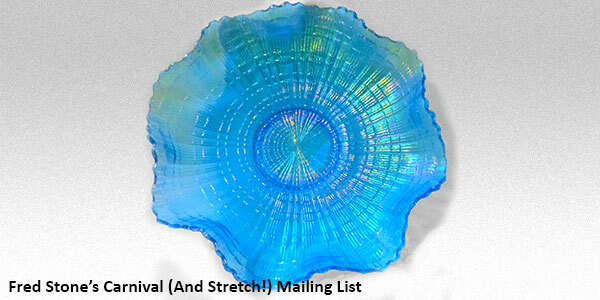 It has great iridescence and color and is only a slightly different shape than those made by Northwood and Fenton. However, there is no record of Northwood making red or Ruby stretch glass, so no danger of confusion there. 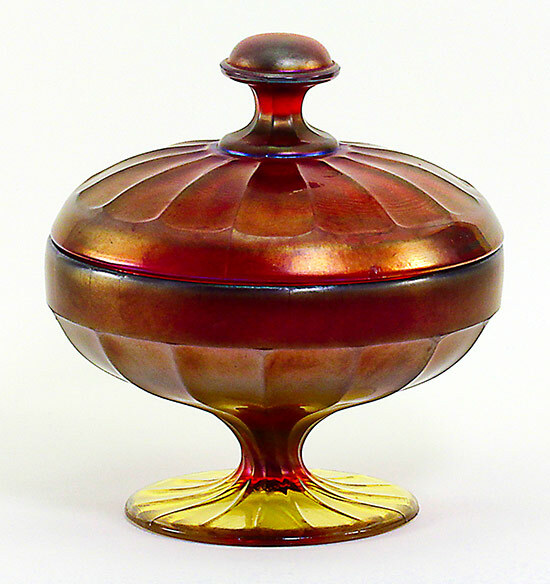 Fenton made lots of Ruby stretch glass, but again, I’m not aware of a Fenton Ruby bon bon. As always, we would be most interested in hearing from you if you have a red or Ruby bon bon in your collection. 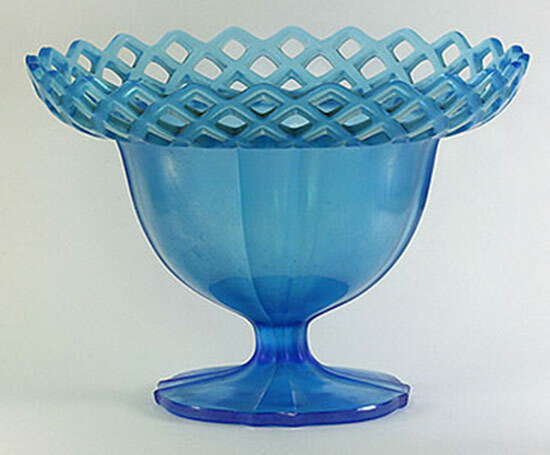 Second is a Velva Rose console bowl. If you want to get a work out while looking at a piece of stretch glass, this is the one for you. It is huge – nearly 13” wide and it is nearly 7” to the tops of those handles and is a lot of glass. 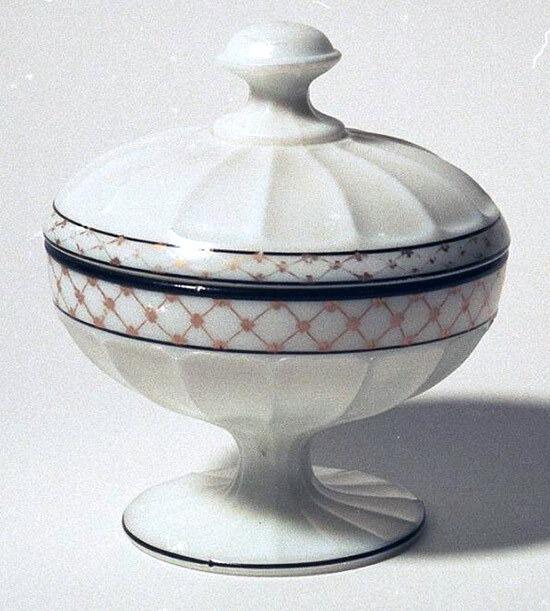 This bowl was made by Fenton using a mould they purchased from Northwood, presumably when Northwood was going out of business. 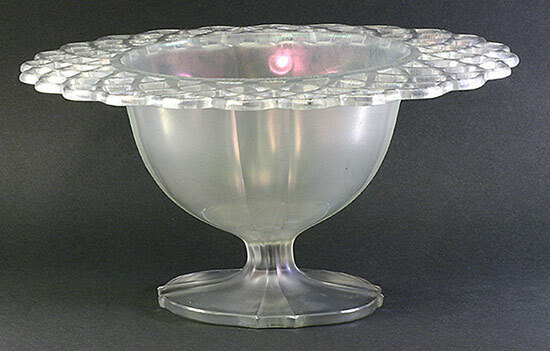 Northwood made large, heavy candleholders to go with their bowls (neither are known to have been made in stretch glass by Northwood) but apparently Fenton didn’t buy the candleholder mould or they never used it because we have never seen a pair of the candleholders in stretch glass. 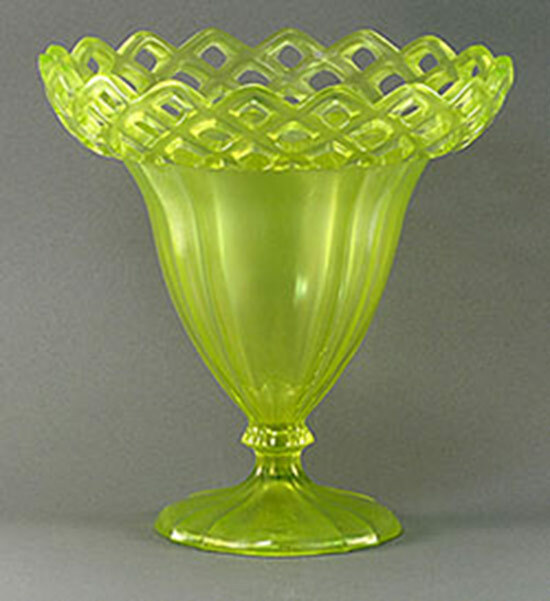 There are other candleholder made by Fenton which are large enough to compliment the bowl nicely. Third is a Northwood bon bon. In earlier stretch discussions we have talked about Northwood’s opaque white stretch glass. It is tough to find and our belief is that it was probably not a color which they put into production. This bon bon is particularly interesting because it is so nicely decorated. 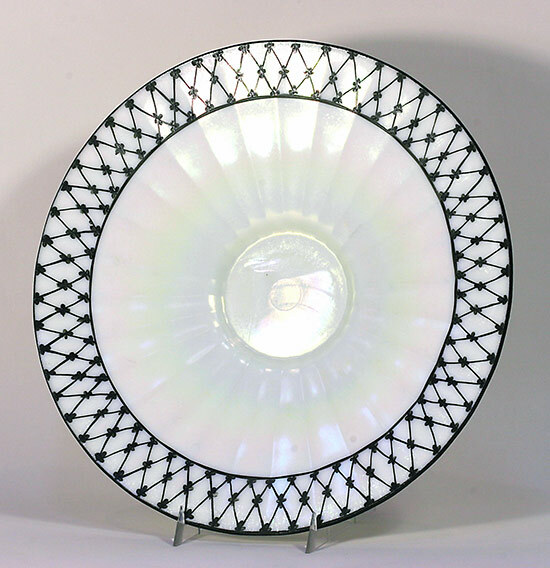 And while we are on Northwood, here is a plate in the same opaque white and also hand decorated. The plate is nearly 12” in diameter. Fifth is a bowl by US Glass. It is Bowl #310 with open work. This bowl is known in several shapes as you can see from the photos. Can you imagine the skill that was required to work the “open work” glass into different positions to create the different shapes we have today? This must have been done by a very skilled worker. Ok, hopefully this shows you some stretch glass that you don’t see every day. If you have something similar –or not so similar and you think it might be a rare stretch glass item – please send in a picture and share it. We are always on the lookout for stretch glass which we have not seen.